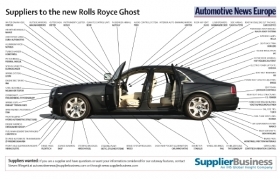 Rolls-Royce unveiled the Ghost at the 2009 Frankfurt auto show. The ultraluxury sedan is smaller and less expensive than its sibling, the Phantom. Wabco Holdings Inc., of Belgium, provides the Ghost's air suspension system giving the sedan a highly comfortable and stable ride. The system's electronic control unit automatically adjusts to driving conditions by intelligently regulating Wabco's latest-generation compressors. The system receives input from multiple sensors distributed around the car, enabling a highly sensitive level of detection. For example, the system can compensate for the sliding of a passenger across the rear seat. The air suspension system also includes a lift and kneel function, raising or lowering the Ghost by 25 millimeters (about an inch) to make it easier for passengers to enter or exit the vehicle. ZF Friedrichshafen AG of Germany supplies the Ghost's eight-speed, shift-by-wire, automatic transmission, which operates with the car's 563-hp, 6.6-liter twin-turbo V-12 engine. Germany's Draexlmaier Group supplies the engine harness and numerous thermoplastic components, including the air exchanger that assists engine cooling. Robert Bosch GmbH of Germany provides the Ghost's electronic stability control and adaptive cruise control systems. Autoliv Inc. of Sweden provides the Ghost's night vision system. Images from a grille-mounted infrared camera are relayed to the driver by a monitor integrated into the dashboard. Pedestrian recognition software evaluates any potential dangers and alerts the driver accordingly. Rolls-Royce assembles the Ghost at its Goodwood factory in southern England. Customer deliveries of the Ghost in Europe began in late 2009. Deliveries are being followed in other markets including the United States through 2010. Prices in the UK begin at 165,000 pounds (about $238,000) before tax and delivery charges.